When we moved to Paris for five months back in 2009, I was excited for many reasons, not the least of which being that I expected I would be eating spectacularly every single day of our stay in France’s capital. To me, as to many other people, Paris represented the epicentre of culinary excellence, considering it hosted some of the best and most-respected cooking schools in the world, trained so many of the greatest chefs in its kitchens and held so many Michelin stars distributed among its restaurants. I had a list of places to visit that was growing exponentially as the day of our departure approached. And then we arrived in Paris. We fell in love with our neighborhood and soon elected our favorite cafés, take-out counters, bakeries and markets. We went out to our friends’ homes and shared incredibly delicious meals with them. We packed simple picnics that we enjoyed on the banks of the Seine or we slurped oysters and champagne from the bottle in a park behind the Sacré-Coeur. And we had a great kitchen in our apartment so I very often felt like eating in, with friends, or just the two of us. 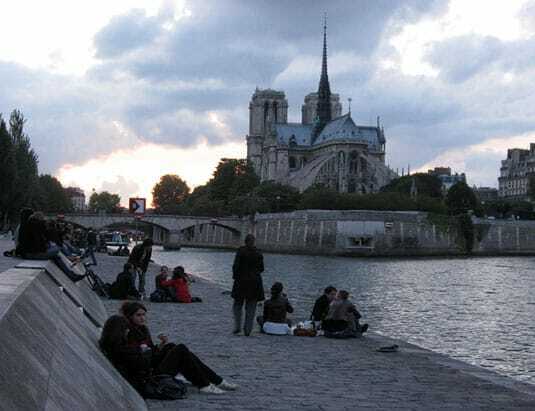 Picnicking on the banks of the Seine while watching the sun set over Notre-Dame. About two months in, I realized that getting to Michelin-starred restaurants wasn’t such a priority anymore – enjoying a day-to-day Parisian life was. For breakfast, once in a while, we would go out to our favorite around-the-corner café to have our orange pressée/croissant/café allongé trio, but most often we just ate our baguette with Nutella in our PJs, at home. For lunch, we often ate leftovers, but sometimes, we let ourselves be seduced by the sun shining down on a cheerful terrace. 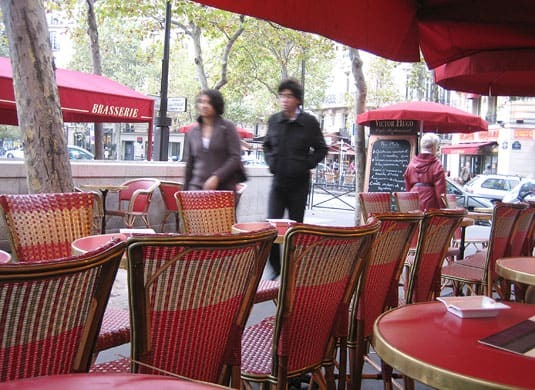 We had long lunches, not because many courses were involved or service was slow (although it often was), but because that’s just the way Parisians seemed to do it. Or we shopped at our arrondissement’s weekly open-air market and had a nice dinner at home while watching a movie. As it turned out, I did eat spectacularly every day – but not in the way I had anticipated. And the cuisine I enjoyed at bistros and cafés wasn’t the one I expected to encounter either. 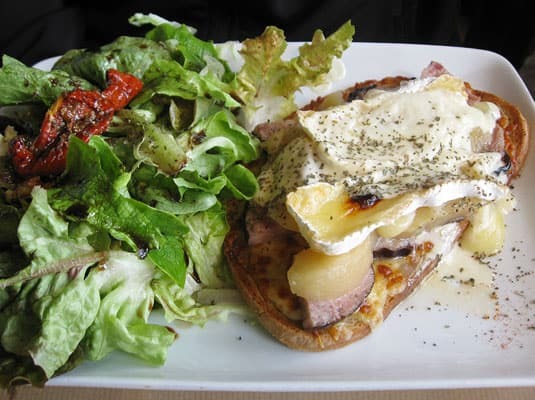 My favorite lunch choices were tartines (open-faced sandwiches) and composed salads. It seemed like all cafés offered variations of these two classics so it was never the same but always light, fresh and flavorful. So many people associate French cooking with fussy techniques and loads of cream and butter – of course this is part of the tradition, but it’s also so much more. I think this is what drew me into Dorie Greenspan’s latest book, Around My French Table. She makes French cooking seem approachable – so much so that many dishes can be whipped up on a week night – imagine that! My favorite lunch in Paris: A luscious tartine with a sharp green salad. Around My French Table features unfussy, delicious dishes, finger-licking-good classics that we love so much (hello, éclairs au chocolat! ), as well as inventive recipes provided or inspired by contemporaries like Pierre Hermé or David Lebovitz. When a step is a little trickier or an ingredient is harder to find, she provides additional explanations or possible substitutions. Dorie’s greatest talent is to make you feel she’s right there in the kitchen with you. And don’t think all the recipes are rich either – being lactose-intolerant, excess use of butter and cream is something I notice pretty quickly in a book, but Dorie doesn’t have a heavy hand. Of course, you’ll never make gougères without butter and cheese, but if you’re looking for something lighter, how about a pissaladière instead? It’s a lot easier to make than it sounds! The lucky winner of a signed copy of Dorie Greenspan’s Around My French Table is: Tanja from I Heart My Food! 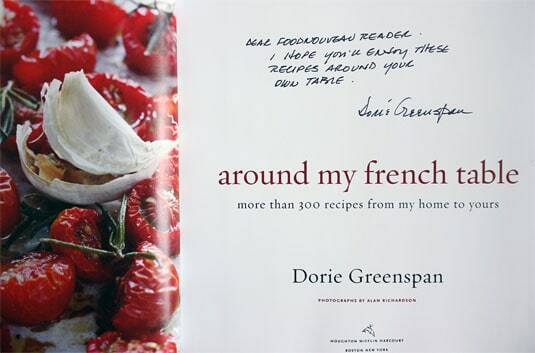 In case you don’t already have this amazing book in your collection, I have a great giveaway in store: a copy of Around My French Table, signed by Dorie Greenspan herself. This is a collector’s item! Scroll down for the giveaway details. But first, I want to share one recipe I absolutely loved, one that should convince you of the book’s simple, fresh and easy cuisine. 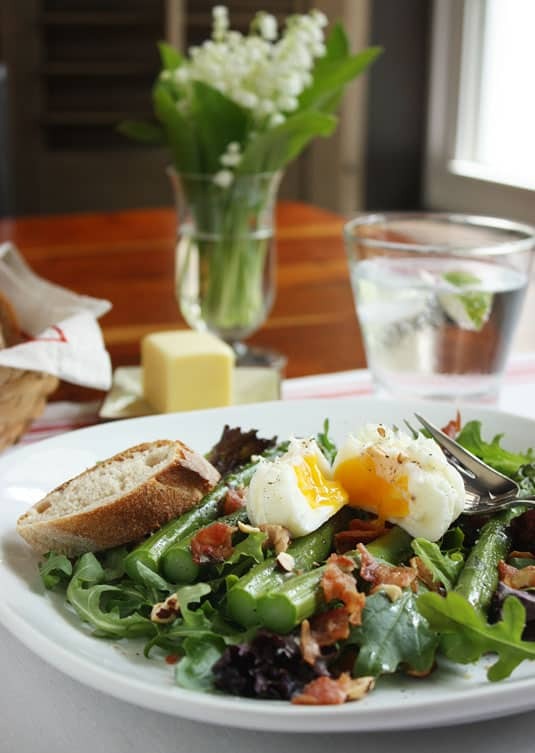 A simple salad, served as it would be at your favorite Parisian café: a perfect balance of ingredients and textures that will seduce every last one of your taste buds. The dish takes no time to prepare, yet is elegant enough to be served to company for Sunday brunch. Isn’t it quintessentially French? Effortless elegance. This is a succint transcript of Dorie’s recipe. 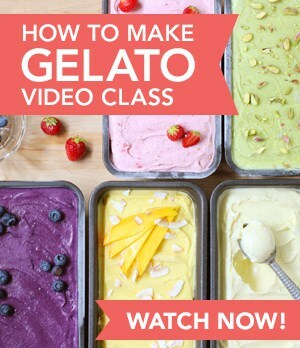 The value of her book is that she provides so much background information as well as so many tips and bonnes idées (good ideas) that it encourages you to become more independant in the kitchen and bring your own twist to her recipes. You simply have to have her book to enjoy it fully. To make the vinaigrette: Put all the ingredients in a small jar, cover, and shake to blend; or use a small bowl and a whisk. You can make the vinaigrette up to a week in advance and keep it in the fridge. Shake well again before using. To make the salad: Bring a medium saucepan of heavily salted water to a boil. One by one, put the cold eggs on a spoon and slowly and gently lower them into the water. Allow the eggs to boil for exactly 6 minutes, then remove the pan from the heat, lift the eggs into a strainer, and run them under cold water to cool them quickly. Fill the pan with cold water and leave the eggs in the water until needed. Pour out the salted water, rinse the skillet to cool it, dry it and lay strips of bacon in the pan. Cook over medium-low heat, turning as needed, until the bacon is golden and crisp on both sides. Remove the strips and put them between a double thickness of paper towels; when the bacon is cool, cut it into narrow strips. Leave 2 tbsp of the bacon fat into the skillet – you’ll use it for the eggs. When you’re ready to serve, very carefully shell the eggs. It’s a fussy job, because the eggs are so soft, and you might not get the shells off cleanly, but unless you break into the yolks, it will be fine. Rinse the eggs to remove any bits of shell and pat them dry. Warm the bacon fat over medium heat. While the bacon fat is heating, assemble the sald. You can put it together on a platter or arrange it on individual plates. 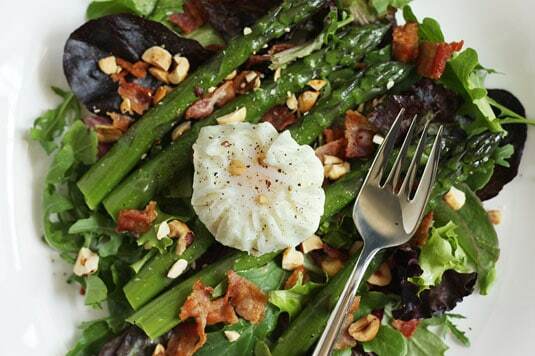 Either way, season the mesclun with salt and pepper, then toss it with about three-quarters of the vinaigrette (or all of it if you already dressed the asparagus), and arrange in the center of the platter or your plates. Toss the asparagus with the remaining vinaigrette (if you haven’t tossed them into it before) and lay the spears over the greens. Now return to the skillet. When the fat is warm, gingerly slip the eggs into the skillet and roll them around in the fat for a minute or two, just to coat them with fat, heat them slightly and color them a little. Lift the eggs out of the skillet and place them on top of the asparagus. Scatter the bacon and toasted nuts over the salad and serve immediately. 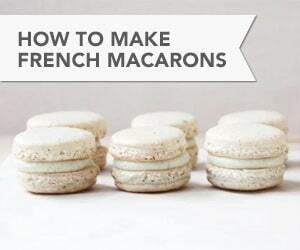 Recipe by Dorie Greenspan, from her book “Around My French Table“. Note: My eggs, as pictured above and below, were cooked using Dorie’s Ruffly Poached Eggs method, which I think made them very pretty and special. If you don’t want to have to shell the eggs, you could very well just poach cracked eggs, as you would to make Eggs Benedict, and still fry them gently in the bacon fat before serving. The chance I had to meet my favorite authors in person at the International Association of Culinary Professionals Annual Conference in Austin inspired me to allow four of you readers to benefit from it as well. In the coming weeks, I have not one, but four fantastic cookbooks to giveaway, all signed by their authors, just for you. 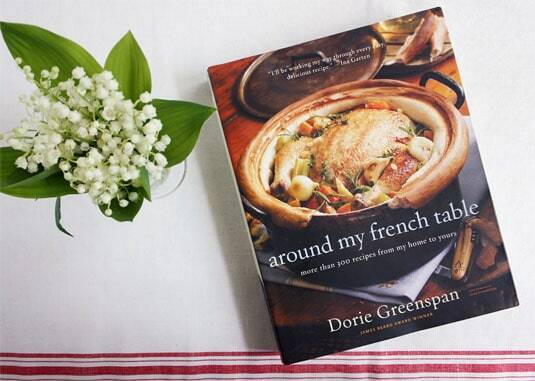 The first giveaway is a copy of Dorie Greenspan’s Around My French Table. It truly is a collector’s item! I will randomly draw one lucky winner on Thursday June 16th, 2011 at 12PM EST. Future giveaways will occur weekly until July 7th. Come back every week to find out which book I have in store for you. 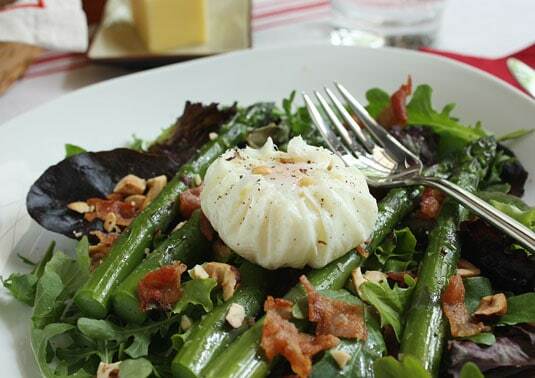 What’s not to love about Dorie…and I happen to have asparagus in the fridge for this salad. Wonderful post, thank you! Dorie is something special. I just entered and really hope I win :) thanks for offering Dorie’s beautiful book! Why is it that the amazing thing about Paris isn’t so much the things that are there, but the simple fact that it’s Paris? The salad looks heavenly! I would love a copy of Dorie Greenspan’s book. Love your blog! Vive le Quebec! Un gros “bonjour” aux gens: vous me manquez beaucoup! Ooh the book looks awesome! Nice photos! Marie, thanks so much for this post. I’m inspired. I’ve just discovered foodneouveau and am jazzed to add it to my favorite stops. Like you, my boyfriend grew up in Quebec (and is a chef). Also like you, I work in a creative field as producer for an ad agency. We are anxious to add this book to our collection and would find it a treat to get it from you and your fabulous blog. Hi Heather, we have a lot in common! Thanks for stopping by, and good luck with the giveaway! I have just visited your blog as well, I hope we’ll keep in touch. What a great giveaway! I love Dorie!!! I love this blog, and love Dorie’s recipes. I would love to try more from this cookbook! I love dorie greenspan and her recipes! This is such a cool giveaway! Would love to get that book! I have been coveting this book for many months now! Hi, would love the book, am both a fan on Facebook and subscribe to your newsletter! New to the world of cooking, and soaking up everything with a baguette! Your pics took me back to a place I fell in love with last November. I hope you were able to enjoy some French Onion Soup on ur visit. Simply the best! great blog and great giveaway!! i love dorie too! that book would be soooo welcome in my kitchen! I adore French food! Along with Dorie : ) Hopefully I’ll be able to cook up some French food with her treasured recipes! I love French food!! I would love to win this book. I love Dorie Greenspan’s books! What I love the most, though, is how helpful she is when people have questions or comments. I don’t think I’ve ever encountered a more gracious writer!